« What Am I Working On? This week I’ve been thinking about my entry for the Writers’ and Artists’ Yearbook Short Story Competition. As I’m sure most of you know, the first prize is £500 and an Arvon writing course. So it’s a prize worth winning and it’s also free entry – which makes it doubly good! But the closing date is 15th February 2014 – so it’s time to start getting my entry together. 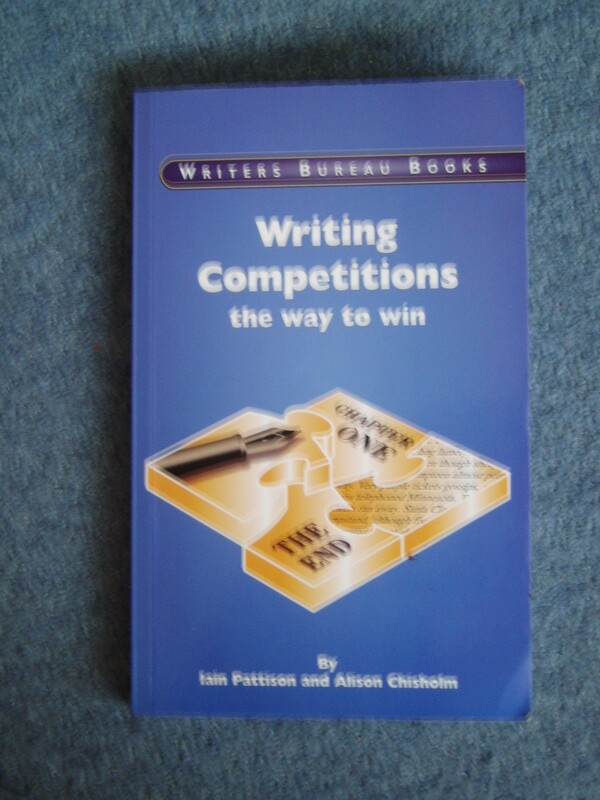 In preparation I’ve been flicking through my copy of ‘Writing Competitions the Way to Win’ by Iain Pattison and Alison Chisholm. The stories were obviously written for a women’s magazine and failed to find a home. Therefore they often have a domestic setting, a female protagonist, a twist ending and the plot is a variation on a theme. The stories lack an individual voice. As a judge, Iain wants to be taken somewhere he’s never been before. He doesn’t want to read about office life and how the junior is plotting revenge on the boss who passed her over for promotion. So, it seems there’s no point in me going through my rejected womag stories to find one that might fit a theme of ‘The Visit’. Incidentally, Iain suggests that this may be why men might seem to do better in writing competitions. Fewer of them write for women’s magazines and therefore they compose a fresh story for a competition without the restrictions of womag writing. What does anyone else think? Have you ever won/been shortlisted in a competition with a story originally written for a womag? And talking of competitions, Nick Daws is running a Guest Post Competition over on his blog. First prize is $50 (or the equivalent in UK pounds). The post must be on a topic of interest to writers and be 500 – 1000 words long. Closing date is 31st January 2014 and entry is free. He ran a similar competition last year and then I was lucky enough to be the winner – this time it could be you! This entry was posted on January 12, 2014, 9:00 am and is filed under Competitions, Non-fiction, Short Story. You can follow any responses to this entry through RSS 2.0. You can leave a response, or trackback from your own site. My W&AYB story is ready to go. I did start writing it as a womag story – but I decided it wouldn’t fit that market and abandoned it. As the idea fits with the theme, I’ve written it the way I felt it should be written, rather than trying to alter it to suit a magazine. None of my competition wins or shortlistings have come from failed magazine stories, but I don’t agree that a story with a domestic setting and female mc etc will automatically lack an individual voice. Thanks for commenting, Patsy and Good Luck with the comp. I too think a domestic story could do well in a competition but only if the plot was quite striking/unusual in order to make it stand out from the crowd. I would think a competition is looking for something a little more striking, though what of course is a mystery. I suppose what stands out would depend a lot on what everyone else writes. If a lot of males entered the competition with male viewpoints then a FMC would stand out or vice versa. You’re right, Swanview – the key is writing something different to everyone else, regardless of the setting. Thanks for the reminder – I definitely want to enter this, because it’s FREE and I would so love to win an Arvon course. I think Iain is right – I’ve never had any success in a competition with a story first written for the women’s mag market. Interestingly I have subsequently sold stories to womag, which were first written for competitions – so it does work that way round! As above the key is to write something as unique or unusual as possible – a story that stands out is likely to be remembered and perhaps do better in a competition. It is a great prize isn’t it, Tracy? And I wish I knew the secret to writing a story that stands out from the crowd! That sounds like quite a story, Susan, and definitely not a womag! Lots of useful advice, thank you. I’ve just bought my WAYB. Quite a hefty investment, isn’t it? I’d better get writing! I haven’t got the latest WAYB, Julia, it is a lot to buy it every year, I agree. The only time I’ve won a prize with a womag type story was when I entered a competition organised by a women’s magazine (Woman’s Realm). If they’re available, I think it’s a good idea to read previous winning entries as that can give you an idea of the sort of story that might be successful, bearing in mind of course that you need to write something ‘original’! Good luck with the W&A comp. I started writing a story for it but then had what I thought might be a better idea … Now I’ve got two beginnings and I’m dithering about which one to work on, but if I don’t hurry up I’ll miss the deadline! Be decisive, Linda and choose which story to go with! Woman’s Realm – that must be a long time ago but well done on the win! Thanks for giving my guest posting contest a mention, Sally. You are very welcome to enter again yourself, of course! Also I wanted to mention that if anyone is thinking of subscribing to Writers News/Writing Magazine, if you subscribe via their website you can currently get a free copy of the WAYB as a bonus. Hi Nick and thanks for the nugget of info. about the free WAYB – it’s a valuable gift! Good luck to all those that enter. I have a few stories that are near completion and a few others that need tweaked. Woman’s Realm? Now there’s a blast from the past. Is it still being published? No, Chris, Woman’s Realm is no longer with us. It’s a shame all these short fiction outlets are disappearing. Good Luck with the stories! Woman’s Realm closed in 2001 – my competition win was in 2000. Seems like a lifetime away now! Fingers crossed that success comes your way again soon, Linda! Today magazines seem more interested in the tawdry, sensationalism of ‘true’ stories. Agreed, Chris, and it’s a shame. I’ve tried to do things the other way around. I entered the New York City Midnight short story competition and the flash fiction one last year. In this competition you work your way up through the rounds, so I had a bit of success in the first few rounds and tried my successful entries as woman submissions. No luck, though. Whoops, just noticed the pesky spell-fixer programme changed ‘womag’ to ‘woman’ in my previous comment. Interesting, Parlance. If you had success in the first few rounds then you’ve definitely got writing ability – keep plugging away at it!